We have a comprehensive range of kitchen safety signs, from food preparation signs to hazard warning posters. Kitchens are full of hazards, from knives and hot grills to spoiled food and slippery floors; our kitchen signs should be used in food preparation areas to identify best practices, and to promote health and safety. All kitchen safety signs are made to meet ISO EN 7010 standards, and they all comply with the Safety Sign and Signals Regulations 1996 and the General Food Hygiene Regulations 2010. Label Source kitchen signs are suitable for use in all kitchens, canteens, cookhouses and restaurants. Mincing / Mixing machine safety label. Food production area. Protective clothing must be worn safety sign. Raw food preparation zone safety sign. Cooked food preparation zone safety sign. Critical control points, temperature values goods inwards safety sign. 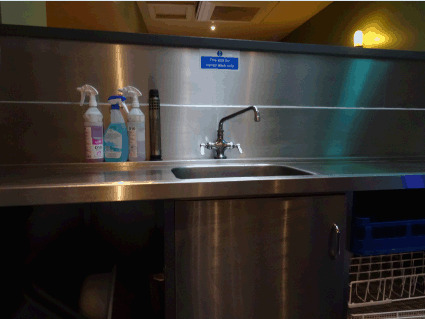 Food preparation area, protective clothing, wash your hands safety sign. Vegetable paring machine safety label. Wear hairnets symbol and text safety sign. Code of practice for use of bandsaws safety sign. Please wash only hands here safety sign. Please wash only food equipment here safety sign. All handlers of food must wash their hands safety sign. Protective clothing must be worn in this area safety sign. This is a food production area safety sign. Do not store cooked and raw food together safety sign. Keep hands clear while machine is operating safety sign. Hair protection must be worn safety sign. All food products must be stored up off the floor safety sign. Food preparation only safety sign. Vegetable preparation only safety sign. Please clean as you go safety sign. Always separate and store raw foods and cooked foods safety sign. Wash and sanitise your hands routinely safety sign. Instant hand sanitiser. Use between hand washing safety sign. Utensil wash only safety sign. Dip your feet safety sign. Danger keep wet utensils away from hot oil safety sign. Clean up all spillages immediately safety sign. Think safe, work safe, be safe safety sign. Critical control points, refrigerators cold rooms safety sign. Safe use of knives safety sign. Prevent cross contamination safety sign. Food preparation area, cooked food only safety sign. Food preparation area, raw food only safety sign. Please remove jewellery before commencing work safety sign. Wash utensils only safety sign. Personal hygiene rules apply beyond this point safety sign. No smoking, food preparation area safety sign. Deep fat fryer safety label. Dish washing machine safety label. Potato chipping machine safety label. Food production area safety label. Now wash your hands text and symbol sign. Food preparation and storage guide. No matter what kind of food you prepare in your kitchen, it's important to have all the correct health and safety signs in place to keep hazards to a minimum. If you can't find what you're looking for in our Kitchen Signs department, give Label Source a call on 0800 3761 693 today.